A BEWITCHING ANNOUNCEMENT: TIGHTEN YOUR SEAT BELTS! This blog has witnessed quite a few “small revolutions” in our lives. In 2010 we moved briefly from Oklahoma to California, and cooked for almost a full year in a nano-kitchen where there was no real stove, no real oven, no real kitchen sink. No dishwasher either, by the way. Last year, as we joined Kansas State University, we went through a phase of alternating weeks camping in an almost empty home in OK and living in the new place in KS. I am not quite sure how, but I managed to keep the blog going through it all. It so happens that we are about to face a new revolution: the renovation of our kitchen! Tomorrow at 8am plastic sheets will enclose the space, cabinets will be removed, floors ripped off. In other words, “all hell will break loose”. Our main goal is to make the place lighter. Everything in the kitchen is dark right now. 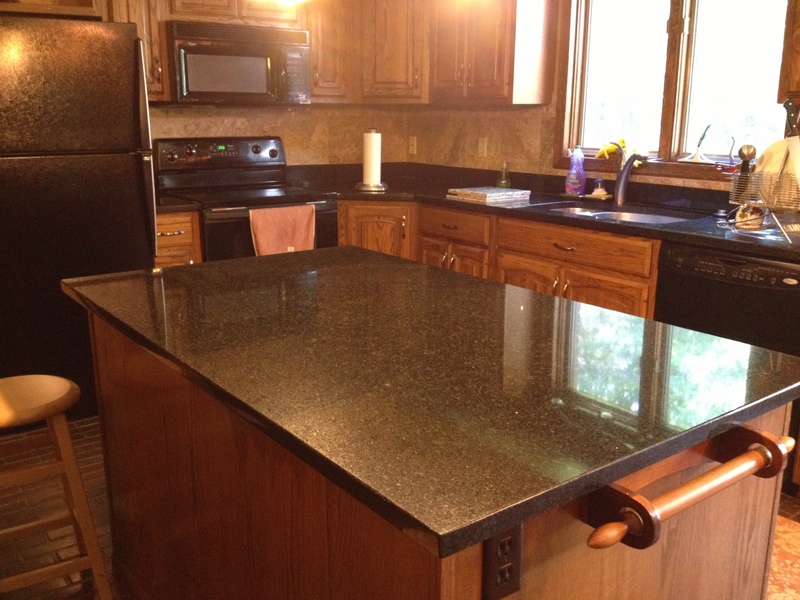 Appliances are black, granite counter tops are black. 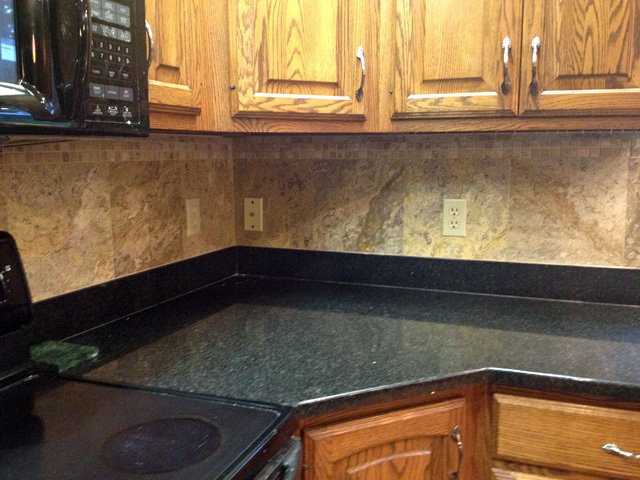 Cabinets are dark, the floor is dark. 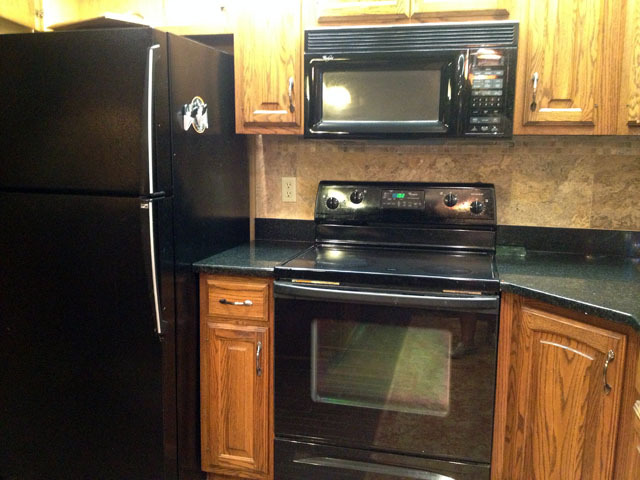 But we also want to modernize the appliances. Keep in mind that we nicknamed our range “Poltergeist”. It gives you an idea of its performance. The fridge makes no ice, but plenty of noises. The dishwasher needs human help to get dishes clean, and whoever designed its racks was a geometry-challenged sadist. So the three appliances are going to be replaced. Wait until you see the range we ordered! It will be a gas range, it will be gorgeous, and it will have a real hood on top of it. Can you imagine the huge smile I have as I type this? I bet you can… 😉 It won’t arrive for a few weeks still, and because the floor won’t be installed until October, we’ll probably not have the kitchen fully functional until then. Every weekend I’ve been writing posts so that the blog can sail as smoothly as possible through the rough waters ahead. But I thought you should all be aware of the excitement behind the curtains… Here are a few shots of the “before”. 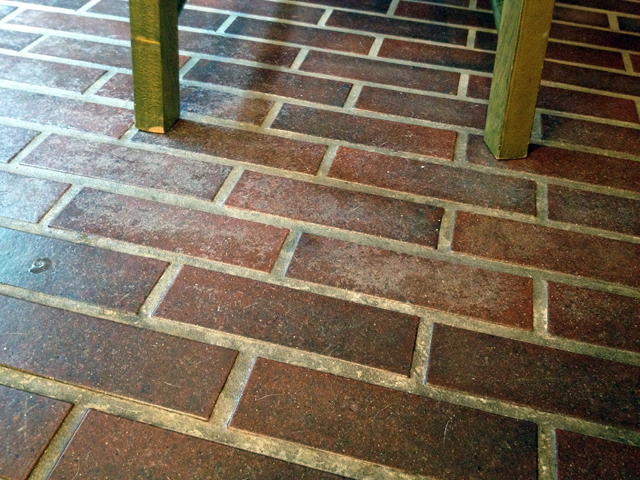 I can hardly wait to show you the “after”, a couple of months from now. Poltergeist plus his partners in crime: the black fridge, the black microwave with a pseudo-hood underneath that pays lip service to fumes. The floor is a bit too rustic for our taste. It seems always dirty, and it adds to the overall darkness of the kitchen. Hardwood floor in our future! Photo of our kitchen, 12 hours after publication of this post: they do work pretty fast! Good luck with the renovation Sally and I’m anxious to see the after pictures. A friend of mine had her kitchen remodeled and used everything in it for a garage kitchen so at least she/he could function through the entire process. Fortunately there is plenty of grill weather to be had and millions of quick and easy dinner recipes to say nothing of the good old crockpot/slow cooker (I own two books on the that topic) Easy Slow Cooker recipes and one Italian version as well. The kindle versions are usually fairly inexpensive so no need to spend a fortune. The Italian book has several recipe that I really like. Sounds like fun! At some point you’ll want to tear your hair out, but keep the end in sight and keep your sense of humor. Can’t wait to see the “after” shots. I remember when younger daughter redid her kitchen. We did dishes in the bathroom lavatory, the refrigerator was on the front porch, etc. It was hectic, but well worth it. You will get through it! I’m so happy for you. It’s funny, when we did our floors, I said that if you have light, you go dark, and vice versa. It’s just about a nice change. Your kitchen is pretty to me and that island is fabulous. But bad appliances? Good riddence!!! Can’t wait to see the changes! I don’t think that’s a bad kitchen, but I still can’t wait to see the new one. It has the possibility of lots of light. I bet it will be beautiful. Sally, as you know we have been through an entire “house revolution”, with lots of casualties on the way…. but we are finally getting out of the dark ages (3 long years). I can hardly wait for your bright kitchen to come along….best of luck! Would love to hear some of the details as you go along, Sally! Best of luck and enjoy the ‘journey’! Enjoy the journey… I intend to, as much as possible! Sally, it’s good you’ve been through a kitchen renovation before and that you start with a good sense of humor! While the current kitchen is attractive, I can see it’s not a “cook’s kitchen” immediately, certainly not worthy of your creative cooking. For one thing, if natural gas is available, who would want a glass-topped electric stove? And you will love having a “real” range hood. I’ve lived through one major kitchen renovation and one new construction and am starting on another new one, so it’ll be interesting to see your job proceed. When we did the renovation, we had the refrigerator in the dining room along with the microwave, did dishes in a nearby bathroom sink, used mostly paper plates, ate a lot of takeout, and generally hated the whole process (9 months). But the result was well worth the pain. Keep us posted, and I hope you can still do some recipe posts along the way, but we’ll understand if most of them are of the “how to roast a turkey in a microwave” variety. Good luck! We are just finishing a very, very minor job-knocking out a wall, to create a dining space out of a small “bedroom” next to our kitchen, and a couple other things. We will be SO HAPPY when we have our house back, and no more workers in & out! 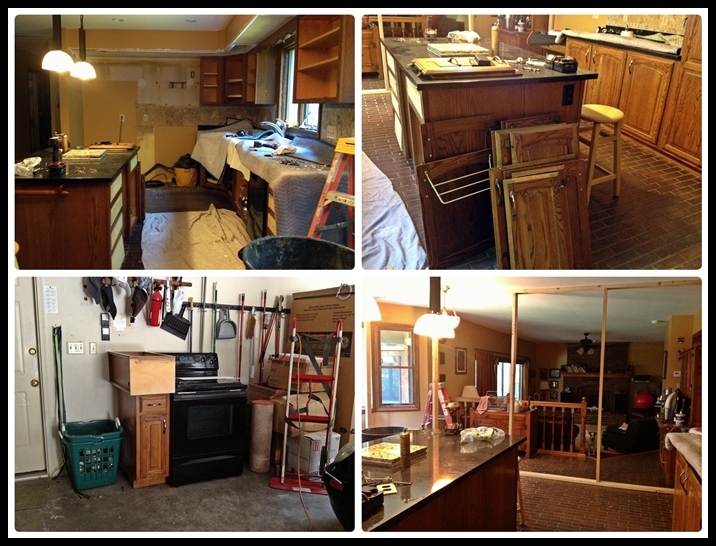 I love before and after photos…..keep them coming! Bem verdade: o inferno passa… no fim tem sempre a luz no final do tunel, ne’? good luck with the renovation! How/where are you going to cook while the work is in progress? Peter says “be careful of hardwood in any area that’s going to get wet”, but I assume you two already know that. Sandra, I don’t care for hardwood in kitchens myself, but many people do. What puzzles me is that I’m seeing a great deal of hardwood floors in new bathrooms. That seems like a recipe for disaster! Good luck, Sally, and my wishes that things will go smoothly. I’m looking forward to seeing that new stove!!! I thought that might be the case, and you’ll notice there’s something else about the stove I didn’t mention! Waddaya mean, the nano-kitchen “didn’t have a dishwasher”? You’re a wife, aren’t you? Good luck with your renovation Sally. Looks like your kitchen could benefit from it. I can’t wait to see the after shots. I am preparing myself for house renovations in the near future, but won’t be without a kitchen, instead it will be my pantry, dining room, and living room! Although frustrating to go through renovations are always exciting! so true, frustrating as it is happening, but always exciting! I know that a fantastic kitchen is waiting for you in the not too distant future – hang in there! nothing better than change for the better!